Childless women of all ages are under assault in America. If you’re a teenager, you’re pushed toward motherhood by “moralizers” bent on denying you information about, and access to, birth control. If you’re a women 35 and older, you’ve been subject to a decade of news stories set to the ominous sound of a ticking clock and bent on creating fertility anxiety–if you wait, you’ll be too late. Recently the anxiety peddlers have been expanding their targeted danger zone to include women in their late 20s and early 30s. “Women lose 90 per cent of ‘eggs’ by 30,” ABC news and others informed us lately, and the message was more of the same: get busy! We have abstinence-only ed to thank for the recent upswing in the teen birth rate, a job assisted by the glamorization of teen moms in the media and of babies in the tabloids and the reality TV shows. Of course the glamour fades fast, and teen moms face big problems. Plummeting high school graduation rates for the moms, and later for their kids. High likelihood of poverty. Small hope of a long-term relationship with, or support from the father. Those are personal problems for the girls and their families, but they’re also national problems as our hope for a globally competitive, educated work force goes south. Education reform not linked to real birth control information doesn’t just leave kids behind, it actively sets them and all of us back. And sure, older women need to know that fertility declines with age. But what are the actual fertility rates of women in each age range? And why is it that increasing numbers of women choose to delay in the first place? What is lost when they don’t? Instead of facts and understanding of the causes and effects of delay, we get a lot of sentimentality aimed at getting you to start your family now. When you consider that 2007 saw an upturn in the birthrate in every age category between 10 and 45 as US births hit an all-time high, there’s a clear disconnect between the high rates of birth for women 35 plus and the claims of the anxiety peddlers. Women seeking full fertility facts should know that the only rigorous study of natural fertility rates (conducted in the 1950s from data collected over years prior) indicated that the infertility rate was 3.5 percent at 25, 7 percent at 30, 11 percent at 35, 33 percent at 40, 50 percent at 41 and 87 percent at 45. (Click here for more on the 1950s data.) Of course individuals differ, no one group is generalizable to all other groups, and data from the first half of the twentieth century wouldn’t reflect fertility degradation that may have occurred from STDs, stress or pollution. But indications are that health and medical advances have improved, not lessened, our natural fertility rates within these age bands. However you understand the relation of this study to the present moment, the rate of decline is nothing like what is suggested by a story with the headline women lose 90% of eggs by 30, implying a similar percentage likelihood of infertility. In addition, IVF, egg donation, adoption and egg freezing have expanded women’s options after their natural fertility goes. But while these often work, they are expensive and unpredictable. And, hard though it may be to imagine in our baby-wild world, many women are happy without kids. They’d be even more likely to be happy if they weren’t being reminded all the time of how unhappy they should be. But instead of a real look at women’s life options, we get a sentimental, inaccurate and incomplete narrative. As for that report on 30-year-olds’ remaining eggs – though the report implies that low egg reserve means a low fertility rate, a closer look at the data makes clear that there is no link. The abstract only cites figures for 30- and 40-year-olds (12 and 3%, respectively), but the full report makes clear that women of all ages have a hugely diminished reserve when compared (as they are here) to the number of eggs a female fetus has at 20 weeks past conception! According to these figures, 25-year-olds, generally understood to be at the height of their fertility, have only 22%, 20-year-olds a mere 37%, 15-year-olds just 52%, 10-year-olds all of 70% and 5-year-olds about 87%. Since few women are infertile at 30, apparently 12% is all you need. What’s left out of all these stories is why women wait. To get an education. To earn a decent wage so they can afford good child care and have enough clout to negotiate a flexible schedule that they wouldn’t otherwise get. To find the right partner for the long term. To mature and maybe see the world. All of these are good reasons. And in fact the average age at first birth of college-educated US women of all races is 30. It is when those reasons for waiting are ignored that everybody loses. The lack of good childcare systems and flexible schedules means many college-educated women who become mothers, like teen moms, are locked into limited career paths that ensure long-term low wages and a limited voice in business and public policy creation (while 50% of middle managers are women, just 17% of Congress is and 3% of CEOs). Women and their families lose out when women’s wages are low, when divorce is inequitable, when careers are “mommy tracked.” The nation loses when the education and insights of half its citizens go unused. Circularly, because the national family-support infrastructure hasn’t changed, women have been unable to move in sufficient numbers into positions where they could change it much. What progress has been made on this front has been entirely due to women’s having delayed kids (by a few years or by many) or not had them at all. If women are pushed to start their families earlier through false or incomplete information, even that progress will erode. Because fertility is experienced as a very personal issue by everybody, it ends up getting very little critical discussion, and that’s a big problem since many women then end up with bad information on which to make life-shaping decisions. 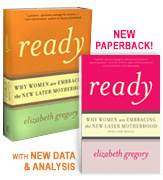 Time for an honest exploration of the dynamics of birth timing and women’s work, especially in our recession. That would be a fertile discussion. background for the 1950s study mentioned in the piece above. To see the comments go to the RHRC and Huffpost links for this post.